If you are looking for a unique driving experience during your Liverpool stag weekend you need look no further than the Hovercraft! These awesome vehicles have a massive propeller at the back that could blow over a hippo and they glide on a cushion of air allowing you travel over both land and water. You will have to negotiate a slalom course, which would be easy in a buggy or a car, but these bad boys never seem to go where you want them and it will probably take you a few minutes to get a feel for the controls and turn in a good time. These awesome machines will definitely keep the lads entertained, but if you want even more action why not combine it with Dirt Buggies or DTV Shredders? 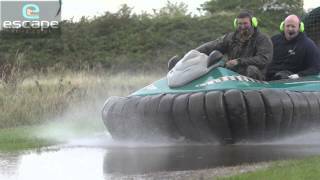 View our Hovercraft video and get an idea of what to expect on this activity.